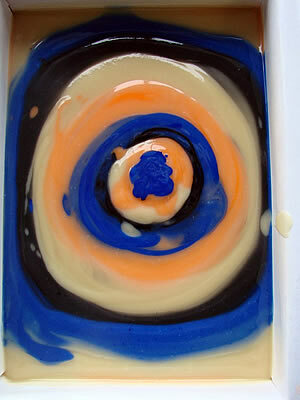 This is a very simple swirl technique with dramatic end results. 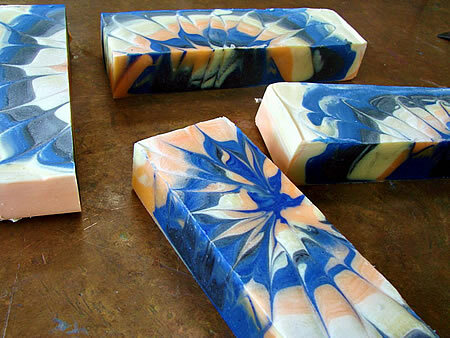 Make sure you have some practice making cold process soap before trying this, so that you are familiar with a light trace versus a heavy trace. It is important to keep the batter nice and thin during the entire process. 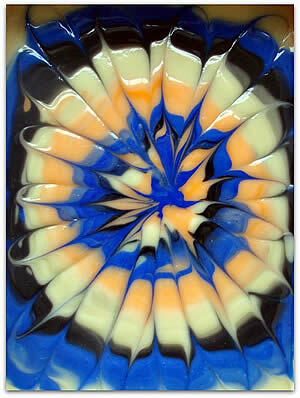 (It is up to you whether or not you use the dividers in your mold. I cut my bars by hand the next day). Before adding the lye to the oils, pour about 1/2 ounce of oil from your batch into three small containers and stir in each pigment in each container. By doing so, you are eliminating clumps of pigment by breaking it down in advance. Then, mix the lye solution into the oils and reach a light trace. Keep in mind, when you use aloe vera liquid as part of your lye solution, it will turn an orange color and emit a light odor that disappears after the soap sets up. 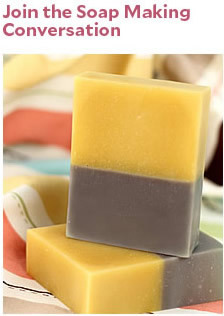 At light trace, stir in the fragrance and split the soap into four equal parts by pouring into the color containers and leaving some neutral in the pot (1 part tangerine, 1 part charcoal, 1 part blue, and 1 part neutral). Stir the colors in by hand. 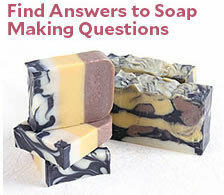 You should not stick blend after reaching trace because it will only make your soap thicker. Aren’t you glad you broke down your pigments first? 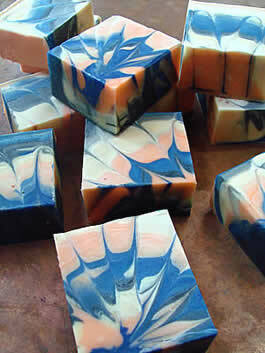 Let the soap harden over night and cut it the next day. Try different colors and see what you get! I went with a dark, medium, and light color for the most contrast. We’d love to see your results.